If you’re in the mood for a half hour of of me, along in my room talking into a microphone, and you’d like to see a sketch of the book I have under development (it’s called Fair Enough? ), you might want to take a look at this video, which was (is?) my contribution to an online climate conference organized by John Foran at UC Santa Barbara’s Environmental Humanities Initiative. 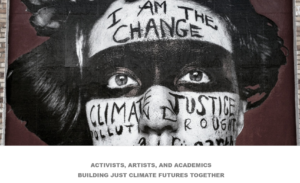 The conference is called ACTIVISTS, ARTISTS, AND ACADEMICS: BUILDING JUST CLIMATE FUTURES TOGETHER and my contribution, which I called “Climate Justice as Climate Realism,” is part of a panel called “The Global Climate Justice Movement in the Age of Crisis. This “nearly carbon-neutral” conference is entirely online. It’s a format that has its charms, not the least of which is that it could be international without involving air-travel. But I must confess that I missed the usual drinks party. You know, actually meeting people and talking. In the flesh.